Sixth in a series. A community can thrive over time only if its members know why it exists and can communicate that with others. Our dominant forms of media have changed the way we communicate. There are many ways in which these changes enhance our ability to become the kind of communities and institutions that matter for our world. We are now better enabled, for example, to develop networks across time and space that help to deepen and even extend the sense that Christians are united with one another across the globe in a common identity, mission and hope. There are also profound downsides to the dominant media -- the practice of hurried reading, the shortening of the attention span, and the sense of isolation and loneliness that can grow from confusing electronic correspondence with palpable human presence (to name only a few of the more obvious ones). One of the risks from our current way of communicating that should most concern Christian leaders is the potential to lose the ability to be articulate. One does not have to read long in the book of Acts before encountering what becomes a major narrative device throughout the story: speeches. There are speeches peppered throughout Acts (by Peter, Stephen, Paul, James and so on). The prevalence of speeches in Acts points to the basic importance of what could be called the articulacy of belief: the ability to say what it is that forms the core of the thriving community’s existence. In our time it is all too easy to equate articulacy with intellectual sophistication. Those who are articulate, we tend to think, work in the university, or at least have received a good education. But according to Acts, this equation is a mistake. In Acts 4 Peter and John are taken before the Jewish authorities and asked by what name they have healed the lame man by the Beautiful Gate (Acts 3). Peter replies to their request with a short sermon. The authorities, says Acts, are stunned at the power of the sermon, because Peter and John are “uneducated, common men” (RSV). The Greek is more emphatic. It says they were “illiterate idiots” (agrammatoi kai idiōtai). In Acts, to be articulate is not necessarily, therefore, to be sophisticated; it is quite simply the ability to say what the ultimate reason for the community’s existence actually is, its raison d’être. Or, in the parlance of the immediate scene, to say by what name the community lives. Knowing the ultimate reason for a community’s existence, however, is not automatic, a given, or something that magically appears in a person’s head upon joining. Much to the contrary, it has to be taught and transmitted, which is also to say learned and received. It takes time, in other words, and requires mechanisms of transmission. It cannot be sufficiently learned in the blink of the eye it takes to read an email or a text message but is instead something into which one is inducted. The necessity to teach and learn the community’s raison d’être is nowhere seen more clearly than in the first and paradigmatic episodes in Acts (chapters 2 and 4). Upon joining the church, the new converts devoted themselves to the doctrinal instruction (didachē) of the apostles. 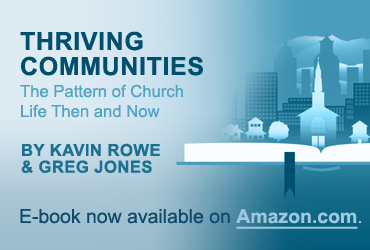 The leaders of the church thought it necessary to teach the fundamentals of their communal life. And the new Christians learned, therefore, what the new life was that they had embraced, what it meant to be Christian. Here, as with the processing of disagreement in Acts 15, we can see traditioned innovation at work in bringing into life and sustaining a thriving community. In the view of Acts, then, a thriving community is one that knows why it exists at all -- the content of its being as a community -- and is able to articulate to others this reason for its existence. Furthermore, it has developed ways of teaching this articulacy to the new people who join the community so that there is a transmission of and continuity in community identity and mission. It would not be too strong to say that without this transmission and continuity in identity, the community has no chance to thrive over time. And absent the articulacy of belief, the possibility of establishing and transmitting -- teaching and learning -- the reason for the community’s existence and core mission is exactly zero.